Bedrock conductors identified associated with mineralised linear magnetic units which outcrop as mafic-granulite and quartz-magnetite (metamophosed BIF). Outcropping mafic-granulite-amphibolite rocks associated with extensive linear magnetic anomalies terminating at a circular, 1.2km diameter magnetic high anomaly - possible mafic intrusion. Anomalous Au, arsenic and reports of gold having been mined in a reef up to 7m thick and 14 g/t Au, pre 1900s, within a Tropicana style setting. New discovery of a Fe rich metamorphosed BIF - Southdown type. 48% Fe average for 5 samples taken across extensive width - strike extent unknown. Located near Mt Barker along the proterozoic Albany-Fraser Orogen, Australia, a 1000km+ mobile belt host to the emerging world class Nova nickel discovery and Tropicana deposit. Only 25km to Port and 5km to railway. A recent Government EM survey has identified probable bedrock conductors associated with a linear magnetic unit that hosts potential for Ni-Cu-PGE, gold and Southdown style iron ore. Highly anomalous Cu with mafic geochemistry in RAB drilling within sediments near a mapped mafic-granulite (559 ppm Cu incl. 0.1% Cu to EOH at 12m) to the immediate north of another 10km+ linear magnetic unit which outcrops in several places on the tenements as mafic-granulite and which terminates in a 1.2km diameter circular magnetic anomaly. Anomalous Au in the only drilling (4 shallow RAB holes) on the tenement , widespread arsenic (up to 1400ppm) in RAB samples and grab samples, and numerous reports of gold having been mined along a “reef” up to 7m thick and 14 g/t Au (pre-dept records) within a high grade metamorphic setting of quartz-feldspar-biotite gneiss. A new discovery of Fe rich banded-quartz-magnetite (metamorphosed BIF) units identical to the Southdown deposit with 5 samples averaging 48%. Located just 3km from railway and roads and just 25km from Albany Port. Fe rich units outcrop/subcrop over 300m+ width with unknown strike extent. The Narrikup project lies within the Albany-Fraser Orogeny which comprises Proterozoic gneiss, high grade metamorphic rocks and granitoid. Two domains are define the Albany Fraser Orogeny - the Biranup and Nornalup Complexes. The Biranup complex comprises highly strained quartzo-felspathic and lesser basic granulites and gneisses that have in places been extensively intruded by syn-tectonic granitoids. The Nornalup Complex comprises poly deformed and highly strained gneisses. BHP divided the Denmark domain into three sub-domains consisting of a lower quartz-felspathic dominant package, an upper psammo-pelitic to pelitic package with accessory basic gneisses and minor banded iron formations and garnet quartzites. Within the project area Tertiary sediments provide extensive cover with occasional outcrops of magnetic mafic-granulite-amphibolite. High grade metamorphic quartz-feldspar-biotite (garnet-hypersthene) gneiss underlies much of the northern half of the tenements. Numerous reports of gold being mined at Redmond in a reef from 17ft-26ft wide (pre-1900s) and gold being panned along Sleeman Creek. Several shafts were reported to have been sunk targeting the “low grade reef” down to 35 ft.
Simto held a licence over the Redmond reef as part of a regional package (no work done completed on Redmond. Simto noted that gold workings are also reported to the SW of Redmond (near Denmark) along the same magnetic and gravity trend. Exploration by Wilga Mines NL in 1997 located some outcrops of gneiss and granulite, limited soil sampling with Cu to 112ppm with only minor anomalous Au. Some possible workings were located, however much of the original workings have been disturbed by farming and lost. Follow up RAB drilling conducted targeting linear magnetic units in the area of reported Au and intersected iron rich weathered mafic rocks in the limited 4 hole program. Anomalous Au recorded however no assays for Ni Cu PGE Co etc. Wilga concluded that the mafic rocks were present over a much wider extent than previously thought. Exploration for Trilogy style mineralisation to the immediate north-east of Narrikup by BHP. 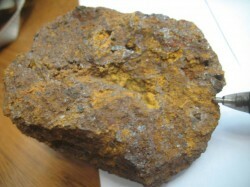 Roadside driling intersected sedimentary and weathered material with highly anomalous copper (0 to 11m at 552ppm Cu incl. 0.1% Cu to EOH) being returned in hole DNAC 64 drilled near a mafic-granulite unit (anomalous Ni-Cr). A Water Department EM survey was conducted over the eastern section of the licence in early 2014. This survey located several probable bedrock conductors beneath highly conductive surface sediments and associated with the mineralised linear magnetic features. The current vendor has been limited to road access given the application stage of the tenement. Mapped outcrops of mafic-granulite have not been visited, however Bob Wanless discovered new outcropping banded magnetite units which returned 48% Fe (ave of 5 samples). $30k option for 12 months, other terms negotiable.